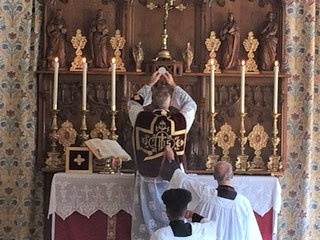 On the 1st July, the Feast of the Most Precious Blood of Our Lord, Fr Simon Henry, Chaplain General in Great Britain, celebrated Mass for those suffering from leprosy, at his church in Lancashire. many chaplains of the Order all over the world did likewise, offering a spiritual work of mercy. It was taken up here at the suggestion of our new Grand Prior designate, H.E. Anthony Dickinson. Devotion to the Precious Blood is not a spiritual option, it is a spiritual obligation, and that not only for priests, but for every follower of Christ. I really believe that one of the symptoms of modern society (and I would even include, sadly, modern Catholic society) one of the symptoms of a growing, gnawing secularism is the lessening and the weakening of devotion to the Precious Blood. Devotion, as we know, is a composite of three elements: It is first- veneration, it is secondly- invocation, and it is thirdly- imitation. In other words, devotion to the Precious Blood of Christ, the Lamb of God who was slain, is first of all to be veneration on our part, which is a composite of knowledge, love and adoration. We are to study to come to a deeper understanding of what those two casual words, Precious Blood, really mean. I found this passage in the oldest document, outside of sacred scripture, from the first century of the Christian era – to be exact, from Pope St. Clement I, dated about 96 A.D. Says Pope Clement: "Let us fix our gaze on the Blood of Christ and realize how truly precious It is, seeing that it was poured out for our salvation and brought the grace of conversion to the whole world." To understand the meaning of the Precious Blood we must get some comprehension of the gravity of sin, of the awfulness of offending God, because it required the Blood of the Son of God to forgive that sin. We are living in an age in which to sin has become fashionable. This veneration of the Precious Blood, which is the first element in our devotion to the Precious Blood means that we have a deep sensitivity to the awfulness of sin. Sin must be terrible. It must be awful. It must be the most dreadful thing in the universe. Why? Because it cost the living God in human form the shedding of His Blood. Excerpted from The Precious Blood of Christ, Fr. John A. Hardon, S.J. 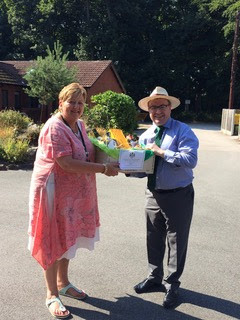 HE Anthony Dickinson, Grand Prior of Great Britain, presented a hamper at the annual St Joseph's Hospice Garden Party recently to assist in raising funds for their work. 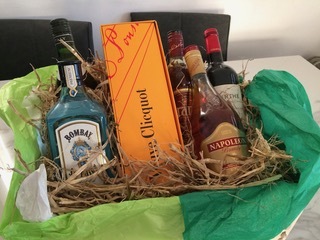 Thank you to members of the Order who donated various bottles to make a welcome addition to any drinks cabinet! 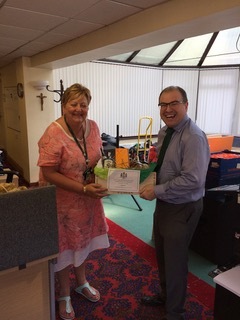 St Joseph's Hospice is one of the charities supported by the Order here in Great Britain, working with Archbishop Malcolm McMahon of Liverpool. The hospice was founded by in the Archdiocese by Fr Francis O'Leary, caring for those with terminal illness. This first small project is the first of many as we work with this local charity, engaging in supporting the life of the Church in our local dioceses.